The art print industry may be a big business but it is not necessarily a lucrative one for artists and can be full of pitfalls. Some manufacturers pre-sell art by doing presentations to retail chain stores. Other manufacturers show thousands of art in their catalogs or on their websites. Much of the art may never be printed because these manufacturers are usually print-on-demand companies. In other words, it is printed only when a retailer or consumer orders the art. Thus, the revenue from the art may be non-existent or very little. And of course, the art is tied-up and not available for licensing to other print manufacturers for several years. According to the research I have done and networking with other artists there seems to be many unscrupulous print manufacturers that are out to make a quick buck and their licensing contracts are not in the artists best interest. Sometimes the artist loses all rights to her/his work. Some manufacturers ignore the contract terms such as sub-licensing the art to other manufactures and the artist gets nothing. Also some do not pay artists the revenue due to them. They may even lie to the artist that their art is not selling when in reality the art is being displayed in stores. SCARY ISN'T IT! But happily NOT all print manufacturers are dishonest. To find out how to protect your art, read art licensing agent Lance Klass article "How an Artist can Avoid Disaster in Today's Print Market." Make sure to read the comments to this article. Lance has an update to the print industry since he originally wrote his article. Artists that are savvy in licensing their work and try to avoid unscrupulous manufacturers network with other artists by questioning them about their experiences with the manufacturers. Some artists avoid print-on-demand manufacturers and instead get deals by going direct-to-retail or direct-to-consumer where they have a chance in making higher revenue. According to a review by Creatives a Work blog about art marketing consultant Barney Davey's book "How to Profit from the Art Print Market", Barney recommends that artists should sell their art to art collectors (direct-to-consumer) as a better way to secure their future. 1. that has popular themes for consumer homes, office and business walls. Coffee, wine, coastal and inspirational words are a few that are popular. Search print manufacturer websites to see others. 2. that have colors that blend with furnishings. Unsaturated colors (NOT bright but more grayed) have been popular for years but these colors seem to be changing. Also black -on-white or white-on-black seems to be popular. Search print manufacturer websites to view recent color trends. 3. with two or more images that can be grouped on a wall. 4. that is formatted as vertical, square and horizontal. Below is a list of some art print and poster manufacturers. Caution: I do not endorse any of these manufacturers because I have no knowledge of their business practices. I recommend that you contact artists that license their work to these manufacturers for information. *** This manufacturer has been endorsed by an artist. See the comment to this article. Thanks for all the info on licensing, my company are looking to design a new logo and we need to ensure we have the full license to use and replicate. I didn't know that art work was the same. Thank you for some excellent information about art and licensing. My daughter is trying to start her own business and this is essential info to share with her before she shares her work with other retail outlets. 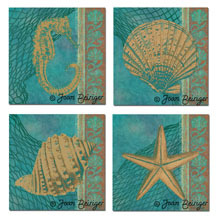 Thank You Joan for another informative and detailed post on art licensing. Thank you Joan. I'd like to add one more art print publisher to your list. Gango Editions http://www.gangoeditions.com. I have worked with them in the past, and did not personally sell a lot, but they were extremely honest, up front and reputable. They do have a huge catalog, which may mean any one individual doesn't sell a whole lot, but you never know. Thanks so much for the link to my article on how to avoid disaster in the print market. As good as I think that article is, it probably needs updating considering the changes that have occurred in the print industry over the past few years. Paper prints that require framing have largely been replaced by wrap-around canvasses, the production process for wall decor has expanded into print-on-canvas itself, and much if not most wall decor products are off-shored instead of being actually produced in the United States. And many if not most wall decor companies have gone either to printing/publishing final product once they have a sale to either a large framer or a major retailer that encompasses a framing facility by direct or indirect means, or else these "print companies" license the artwork to a major framer for all production. That means that the print companies can avoid being "awash with paper" - giant warehoused inventories of prints and canvasses - and become, in effect, licensing agencies themselves. In this type of scenario, the print company might make ten cents on the dollar from the framer, and then pay you 10% of what they make. That brings your royalty down to a penny on the wholesale dollar, not much at all even with very large production runs. It's a new world out there in the print industry. In recent years, many print companies have gone out of business or diversified into other, related fields. For a while, consolidation was the name of the game. It's refreshing and encouraging that Gango Editions and some of the other long-established wall decor companies are still going, and occasionally going strong, and I'm hopeful that increases in consumer spending and consumer confidence will bring ever more life to this vibrant home decor industry.